Annette and Jeff Freking at their brand new Electrolux equipped Perry Creek Laundry. A few short years ago, Annette Freking worked as a registered nurse, while husband, Jeff, farmed and tended to his real estate properties. The pair often spoke about opening a business together, yet didn’t exactly know what entrepreneurial venture to pursue. However at that time, they would never have imagined themselves as the proud owners of Perry Creek Laundry, located in Sioux City, Iowa. Electrolux Professional laundry equipment is designed to maximize your profits while saving water and energy. Some of the benefits of laundry ownership that were particularly attractive to Annette and Jim were the low fixed costs, the overall manageability of the business, and of course the potential for a strong return on their investment. So what started out as a business idea that never even occurred to them now became Annette and Jeff’s number one business option. Subsequently they began their extensive laundry research online and in person, visiting roughly 15 Laundromats. They also investigated different equipment brands, prices – and other distributors. Pair Electrolux Professional dryers with Electrolux high G-force washers, and you create an even stronger competitive edge: increased load capacities, faster drying, less wear and tear on garments, lower energy consumption, and time savings. The build took roughly two years from the time Annette and Jeff decided to enter the laundry business to Perry Creek’s opening day. Their “must-have” laundry list included a front door that opened and locked automatically, lots of windows, an office with a service counter, free Wi-Fi, convenient parking, and plenty of seating – inside and out. “The outdoor tables and chairs give our store a little something extra, something special,” added Annette. Additionally Jon made the recommendation to purchase Electrolux laundry equipment. Plenty of parking at Electrolux equipped Perry Creek Laundry. Besides making drying faster, the soft-mount washers make for an easier installation process on wood floors, upper levels and over basements. The heavy-duty construction of the equipment ensures a trouble-free operation as well as a longer machine life. In addition to superior equipment and time savings, Perry Creek Laundry offers its patrons wash-dry-fold services. The store takes coin, credit, debit, and loyalty cards. Partially attended, Perry Creek has eight security cameras, three televisions, and a Vendrite soap and snack vending machine. In mid-January 2015, Perry Creeks enjoyed its Grand Opening offering its customers a week’s worth of free dry days and daily drawings to win free loyalty cards. Leading up to opening day, the couple ran a local radio spot and passed out brochures in the community. “We are also on Facebook and of course, word of mouth has been tremendous for us,” shared Annette. This entry was posted in News and tagged Electrolux, Electrolux laundry equipment, laundromat, laundry business, Laundrylux, Perry Creek Laundry. Electrolux Professional laundry equipment – H Series, Soft Mount Washers. This entry was posted in News and tagged commercial laundry, Disaster relief, Electrolux, laundromat. 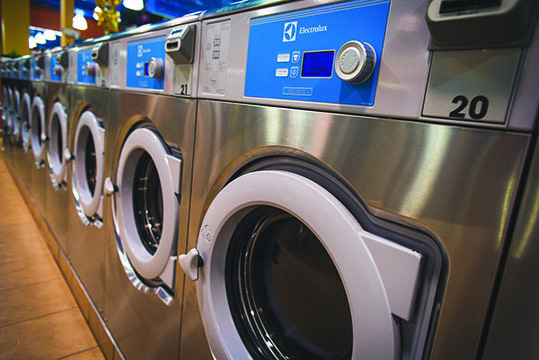 Electrolux helps California laundromat dramatically lower utilities and achieve profitability. Electrolux Professional washers and dryers dramatically lower water, energy, and increase profits. Customers appreciate the fast drying and time savings! With strict water conservation efforts, severe drought conditions, and low water supplies, a person might think twice before opening a laundromat in Palmdale, CA, located in the Mojave Desert. However if you’re Sterling Phillips, a multi-store owner and SES Laundry distributor who knows a thing or two about saving money on utilities and achieving profitability, then by all means – what’s stopping you? He was also keenly aware that his competitors had smaller locations, older equipment, and much less parking. Based on all the facts and his industry experience, Sterling quickly surmised that the demographics were excellent and there was sufficient demand for a new and improved laundry in the marketplace. The Phillips brothers – Sean and Sterling Jr.
Needless to say, Sterling has been involved in every aspect of the laundry business – from cleaning, maintenance, and management, to multi-store owner and developer. “It was a wonderful experience working side-by-side, learning from my father. Of course, my kids want to be doctors,” Sterling joked. Today, Sterling still works with his family. “As the family business diversified throughout the years, my brother moved in the direction of managing our self-serve laundries, while I took on the SES distributorship,” Sterling explained. 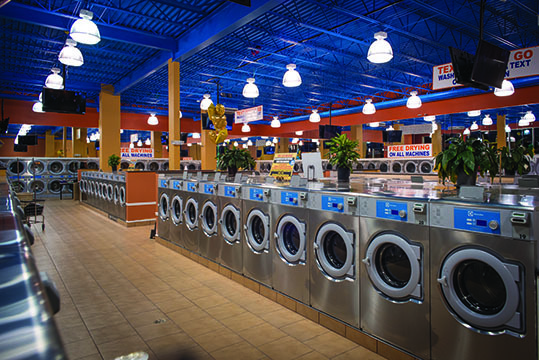 With his hands-on know-how and the innovative design and equipment resources of SES Laundry behind him, Sterling began the business of re-tooling the outdated laundry into a well-lit, wide-open space that offers a roomy folding area and a large mix of machines to appeal to every customer. Sterling knew choosing the right equipment mix could make or break his desert store. He also knew that Electrolux Professional coin laundry equipment was specifically designed to dramatically save on water and energy while adding to his bottom line. What’s more, the Compass Pro feature gives Sterling the opportunity for higher revenue. For instance, he can offer his customers special wash cycles. 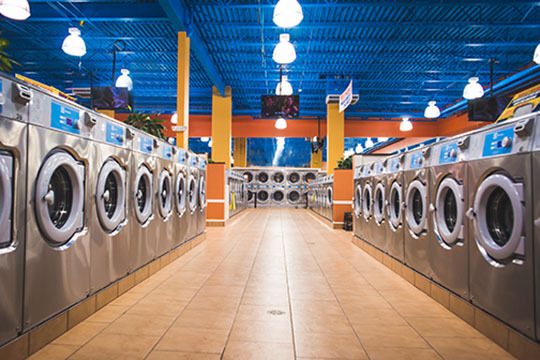 The desert may have its challenges, yet thanks to Sterling’s vast experience, Lucy’s Laundromat has been designed to be comfortable and appealing in spite of drastic weather changes or water restrictions. Since opening its doors in March 2014, a loyal Lucy’s following continues to flourish. Sterling knows that out of all the transformations the store underwent, the most impactful upgrade has been the equipment. This entry was posted in News and tagged Coin Laundry, commercial laundry, Electrolux, laundromat, Laundrylux. Super 8 in Ukiah, California. 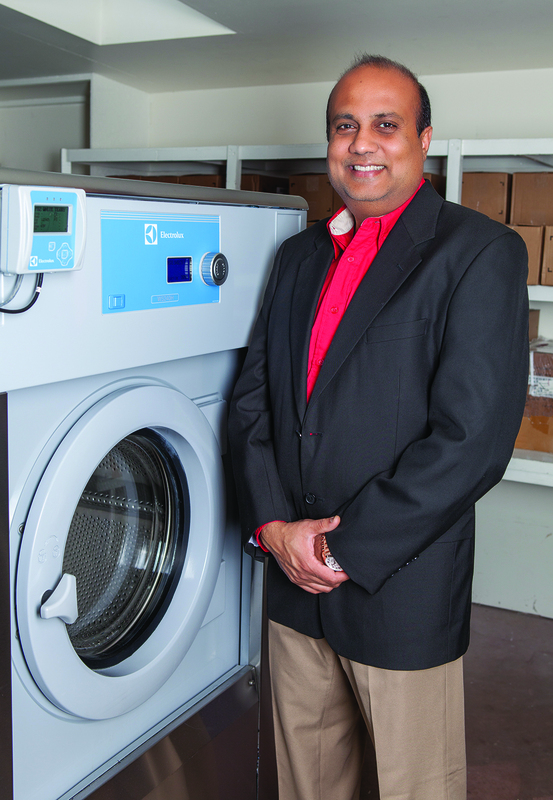 Owner Raakesh Patel estimates 20-25% immediate savings with Electrolux Professional laundry equipment and PLUS system. In the hospitality business, many owners see only two worlds to spend money: the front of the house – amenities and features that attract and cater to guests; and that other land known as the back of the house. Most owners place these worlds in different galaxies. Raakesh Patel is not like most owners. His Super 8 Ukiah, California property strikes a true balance between the two worlds. Indeed, Patel sees things differently, and the primary color he is focused on is green. It’s his passion to show others how eco-friendly lodging makes both sense and cents. “Green is not just a fad or a marketing theme,” Patel said, adding that he wants to make a difference, not just at his property, but in the world. And with today’s severe drought conditions in California and many parts of the world, conserving water and the earth’s precious resources is critical. Raakesh Patel, owner of Super 8 in California, is a big fan of PLUS – Professional Laundry Utility Service. No capital expense, simply pay per use. With a lifetime parts and labor warranty, and all parts and service included, he was sold. There are more than 7,600 properties under the Wyndham Hotels umbrella. 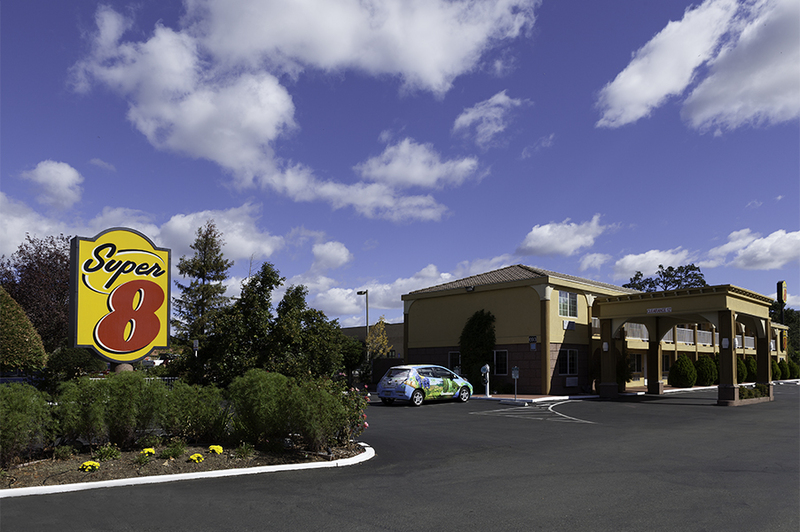 In 2012, however, Patel’s Ukiah, Calif. Super 8 location stood out from the group, garnering the prestigious Wyndham Green Award. This award is presented to owners whose properties have made a concerted effort to engage in practices that contribute to the betterment of the planet and offer guests a green environment. Patel’s 54-room property brings features that truly set it apart, things such as energy efficient lighting, room systems managed by occupancy sensors, and a recycling program that cut his waste bills in half. His was the first Super 8 in the Wyndham group to install charging stations for electric vehicles, a move he said raised a few eyebrows. That is until people started showing up and plugging in… and raving about the hotel online. The property’s commitment is evident in a variety of other certifications including: California Green Lodging certification; Platinum certification from Green Business Bureau; four-key rating by Green Key Certifications; and certified gold level by TripAdvisors’ Green Leader program. Super 8 also recognized Patel’s effort by presenting him with the Spirit of Super 8 award. “It’s an amazing feeling… I feel so honored,” Patel said. But those awards weren’t the culmination of his work; they were just the beginning. “Now I need to do something in the laundry,” Patel said of the next stage in his commitment to the environment. In that land known as the back of the house, the laundry neighborhood ranks as a necessary evil. Hoteliers often see it as a cost center, only drawing attention when equipment breaks down and loads are stalled. Super 8 in Ukiah, California – sees tremendous savings in water and energy with Electrolux Professional Laundry and PLUS. “One of the most major expenses in a hotel is a laundry,” Patel said. So, naturally, where other owners see a drain on resources, Patel saw opportunity and one that he could make a major impact on with a green focus. “But it has to be done right,” he added of making sure to perform research in advance of rolling new equipment and system in. At the time, his dated hard-mount laundry equipment was giving him headaches. An expensive bearing replacement and having to re-pour the unit’s concrete pad had him wondering about a better solution. A conversation with his distributor Viking Service about new Electrolux washers and a PLUS system that eliminated large upfront capital expenditures got him thinking. “I was wondering, how much more can I really save with new equipment,” he said of his original skepticism of bringing in new Electrolux Professional washers, and just how utilizing the PLUS industry-exclusive pay-per-use system would make good fiscal sense. Then he started running the numbers on his costs for six to seven loads a day (more in the summer) and he was intrigued. With PLUS – Professional Laundry Utility Service – Patel simply uses the equipment as needed and pays only for that usage – no expensive linen rental or laundry contract. PLUS laundering becomes a utility service – just like water, gas, and electricity. Like any utility, you pay for PLUS only when you use it with no long-term obligation. With a lifetime parts and labor warranty, all parts and service included in the program, he was sold. That’s capital that could be better allocated in other areas of the business. In addition, PLUS systems provide Electrolux Professional laundry equipment that is designed for exceptional results, increased productivity, and the lowest water and energy usage. 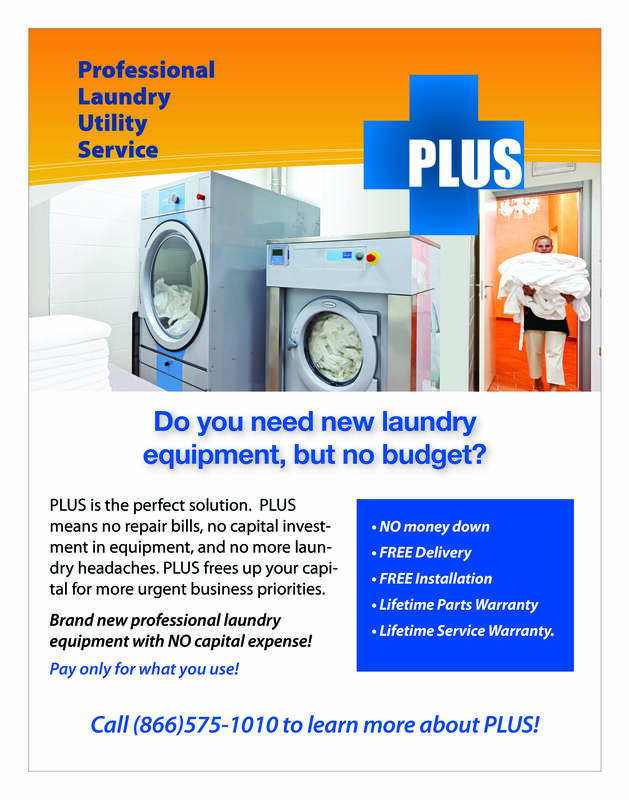 Need new laundry equipment but do not have the budget? Learn more about PLUS! Many owners might be satisfied with a move to soft-mount washers boasting super high G-force extraction (450 G-force), which reduces energy usage and cuts drying time significantly from high-speed hard-mount washers. Again, Patel is not like most owners. When he learned of Smart Dosing, an Electrolux Professional innovation that automatically ensures the proper amount of laundry chemicals are added to match the load size, Patel made sure his Ecolab chemicals were being managed by this technology. Add in Electrolux’s unique Automatic Water Savings (AWS) system, which adds precisely the correct amount of water to the load size, and water consumption can be reduced by up to 50%. Patel appreciates the fact that his hotel is partnered with a company just as committed to the environment as he is – Electrolux’s sustainability approach is world-renowned. Electrolux has been recognized by CDP as a climate performance leader, was selected for the Global Compact 100, and is a member of the Dow Jones Sustainability World Index which includes the best-in-class environmental performers in the world. Electrolux is constantly working on reducing the environmental impact of products and factories according to the strictest standards. 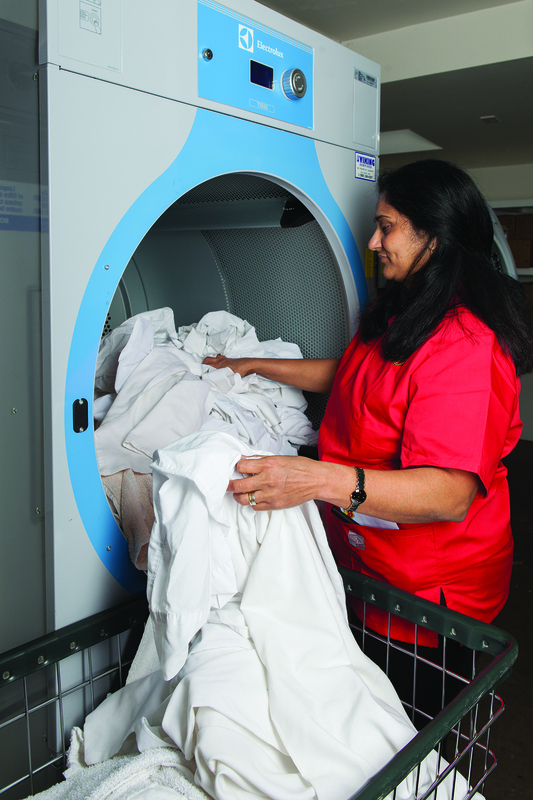 Patel sees the technology he’s employed in his laundry as the perfect recipe to deliver green results and much more. “I have a system that accurately and efficiently adds up to great savings in dollars and very importantly, for a low impact on the environment,” he said, adding that savings are reflected in lower gas, electric, water, and sewer costs and help reinforce the Energy Star rating for his property. Patel estimates his laundry savings total 20-25%. But the benefits are reaching much more than his utility bills. Faster cycle times in the laundry have given housekeeping staff additional time to take on other projects in the front of the house – keeping with Patel’s focus on providing the highest quality lodging experience for his guests. Guest surveys show the fruits of his labors, as the property consistently receives high marks and rave reviews online. And the laundry is a key component. Gone are the survey comments from the past mentioning rough towels that felt “like sandpaper.” Now he reads comment after comment about how soft and fresh his linens and towels are, he says. Reprinted with permission from American Laundry News. This entry was posted in News and tagged Electrolux, laundry equipment, Laundrylux, PLUS system, Super 8, sustainability. Neal Milch, CEO of Laundrylux, and Keith McLoughlin, Electrolux AB President and CEO, at meeting in Sweden to celebrate 60 year partnership. Keith McLoughlin, Electrolux AB President and CEO, recently invited Neal Milch, CEO of Laundrylux, to Sweden for a special ceremony. On behalf of Electrolux, McLoughlin presented Milch with a crystal award to celebrate 60 years of doing business together. To learn how this great partnership began, we have to go back to the mid 1950s. A young man with an engineering background and experience in laundry equipment sales and service was hired to assess damage to the laundry equipment aboard the Swedish American Line’s M/S Stockholm after the ship collided with the Andrea Doria, near the Island of Nantucket. The young man’s name was Bernard Milch, founder of Laundrylux. This was Milch’s first introduction to the Swedish-made Wascator (later named Wascomat) front-load stainless steel washers. He was extremely impressed that the machines remained functional after the water-filled laundry area was drained. Milch made inquiries to the Swedish company and eventually purchased a Wascator washer for testing and technical investigation. Milch’s testing confirmed his initial confidence in the Wascator machines. He was convinced that commercial front-load washers could revolutionize the industry. Milch obtained the sales and marketing rights for Wascator machines in North America and, since he ate lunch at the “Automat” and liked the sound of the name, decided to use the name Wascomat for marketing. He seized the opportunity and the industry was changed forever. Electrolux, which later purchased Wascator, credits Wascomat’s growth in North America to the extraordinary marketing efforts of Milch and his team. Since then, Laundrylux has become a valued partner representing the Electrolux Professional and Wascomat commercial laundry brands in North America. Electrolux is a global leader in household appliances and appliances for professional use, selling more than 50 million products to customers in more than 150 markets every year. The company makes thoughtfully designed, innovative solutions based on extensive consumer research, meeting the desires of today’s consumers and professionals. In 2013, Electrolux had sales of SEK 109 billion and about 61,000 employees. For more information go to http://www.electroluxgroup.com. Laundrylux distributes Electrolux professional and Wascomat commercial laundry equipment in North America through its extensive distributor network. The company offers state-of-the-art commercial laundry equipment for the vended and OPL markets, as well as PLUS Professional Laundry Utility Service, financing, and marketing. To learn more, call (800)645-2205 or visit www.laundrylux.com. This entry was posted in News and tagged Electrolux, Keith McLoughlin, Laundrylux, Neal Milch, professional laundry equipment, Wascomat. Middlethorpe Hall in York is one of the most highly-regarded hotels in the North of England. With its enviable location consisting of 20 acres of manicured gardens and parkland, the property was originally built in 1699 and, after being rescued from decay, was restored by Historic House Hotels in 1984. In 2008, ownership of Middlethorpe Hall was transferred to the National Trust by donation with all profits benefiting the houses and the charity. Today, the venue boasts 29 bedrooms and a luxury health spa. Though the property decor, antiques, and fine art are consistent to the style of the 18th century, behind the scenes is a different story. The modern spa is one of the major features of the hotel, with an indoor swimming pool, steam room, sauna, and gym. As hygiene and cleanliness are paramount, the hotel made it a priority to install Electrolux Professional laundry equipment, the most advanced and innovative system available. Having the laundry in-house enables the hotel to control the process and meet their highest expectations and requirements. Also, since Electrolux Professional laundry equipment uses less water and is faster drying, the hotel has increased productivity while eliminating the costs and inconsistent results of outsourcing. High-extract W4240H Washers with Automatic Water Savings (AWS). This unique feature weighs the load and adds precisely the correct amount of water — automatically – leading to a considerable savings. The large doors make it easy to load and unload and it operates at low noise levels for a comfortable working environment. T4530 Dryers with the ability to process two full loads per hour. IC43316 flatwork ironer – which can process sheets, duvet covers and table cloths, as well as napkins and pillowcases. Lionel Chatard, Director and General Manager of Middlethorpe Hall commented: “Laundry is a priority for us. Not only do we have to ensure we clean guests’ towels, bed linen, table linens, and uniforms on a daily basis, but we also have an extremely busy spa to cater for in terms of linen and towels. This entry was posted in News and tagged Electrolux, Electrolux Professional, in-house laundry, Laundrylux, Middlethorpe Hall, professional laundry equipment. Il San Pietro di Positano, a member of the prestigious Relais and Chateaux, is much more than a posh hotel, it is the emblem of exclusivity. Relais and Chateaux, established in 1954, is an association of the world’s finest hoteliers, chefs and restaurateurs – and becoming a member is quite an achievement. The transcendental Hotel San Pietro di Positano, overlooking the bay of Positano, is a unique blend of luxury, passion, and simplicity. From the main terrace you can gaze out to the coast as far as the Faraglioni of Capri – or enjoy the breathtaking, world famous view of Positano. A perfect balance of nature and architecture, the hotel seems hidden within the mountains of the Amalfi Coast, yet the terraces unexpectedly offer an unparalleled view of the sea. Electrolux Professional Laundry and kitchen equipment at Il San Pietro di Positano. Vito Cinque, Director and Owner of the San Pietro, believes in unequivocally providing his guests with the very best of everything. “We have two restaurants: the Michelin-Star awarded Zass (nickname for my Uncle Salvatore) and the Carlino on the beach front (in honor of my Uncle Carlino Cinque, the hotel founder). For the Zass kitchen we chose Electrolux Professional solutions, and for the Carlino we went for the most prestigious Electrolux brand, Molteni. Electrolux Professional has been our only supplier for both the kitchens and laundry,” says Vito Cinque. 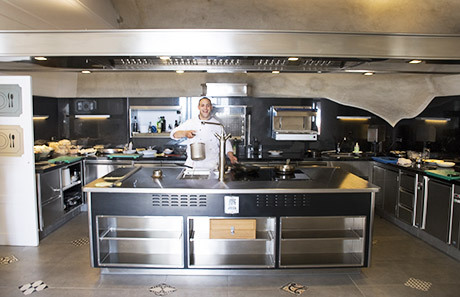 Electrolux’s Molteni brand takes center stage at the Carlino restaurant at Hotel San Pietro. The beautiful Molteni suite, chosen for superior performance as well as the possibility of customization, stands in the center of a spacious room: 2,8 x 1,3 m of power and a one-of-a-kind design. With brilliant stainless steel and chrome trim, the Molteni stove was designed and built with three different preparation areas: the left side for starters, the center for first courses, and the right side is dedicated to cold dishes, salads, and desserts. For the meat and fish dishes, the unmatched Molteni Rôtissoire was the preferred choice, in black enamel, stainless steel, and chrome. Linens and towels at Il San Pietro di Positano are expertly cleaned with Electrolux Professional Laundry equipment. The hotel recently chose Electrolux Professional Laundry solutions including washers, dryers, and ironers, for its internal laundry operations. Electrolux professional laundry equipment is designed for reliability, low water and energy usage, long-life, and low running costs. Electrolux is constantly working on reducing the environmental impact of its products and factories according to the strictest standards – while providing customers with best-in-class laundry solutions and innovations. Champions in efficiency and sustainability, Electrolux has been recognized by CDP as a Climate Performance Leader, Global Compact 100, Dow Jones Sustainability World Index, RobecoSAM Sustainability, and was named by Forbes as one of the World’s most reputable companies. This entry was posted in News and tagged Amalfi Coast, Carlino Cinque, Carlino restaurant, CDP Climate Performance, commercial laundry equipment, Dow Jones Sustainability, Electrolux, Electrolux dryers, Electrolux equipped, Electrolux Grand Cuisine, Electrolux Professional, Electrolux Professional food service, Electrolux professional ironers, Electrolux Professional Kitchen, Electrolux Professional Laundry, Electrolux Professional North America, Electrolux Professional washers, Electrolux professional washers and dryers, Fine hotels, Forbes, Global Compact 100, hospitality laundry, hotel laundry, Hotel San Pietro, hotel sustainability, Hotel Sustainability Solutions, Il San Pietro di Positano, in-house laundry, laundry equipment, Laundrylux, luxury hotel, Michelin star restaurant, Molteni, Molteni Rotissoire, on premises laundry, On-premise laundry, OPL laundry, Positano, Relais and Chateaux, Relais Chateaux, RobecoSAM, sustainable products, Vito Cinque, Zass restaurant. Five Stars. It’s a term reserved for the finest of restaurants. It’s the rating synonymous with the most luxurious of hotels. It’s the phrase film critics unholster only for the “Citizen Kanes” of the silver screen world. No doubt five stars is the ultimate measure of quality…the best of the best. That was the driving force for John Pinnock in developing his Baltimore-based Laundry City business. “I wanted this to be a true five-star laundromat,” Pinnock said. And don’t try to sway him that the terms “five-star” and “laundromat” historically have not been paired together. Pinnock knows the traditional view of laundries as dark and dingy was a major hurdle, but he wasn’t backing down from his charge. “My goal was to change the mentality… to make this a place people want to come to and stay,” he said. 10,000 sq. ft. Electrolux-equipped Laundry City in Baltimore, MD – John Pinnock’s 2nd Electrolux-equipped laundry. One could say Pinnock’s vision for the laundry started at an early age, or at least he understood the need the business is based on. Attending a boarding school, it was incumbent upon students to look their best, and clean clothes obviously were a major part of that. “It was always important to have clean clothes. It was ingrained in me at a young age,” he said. While the seeds of the business may have been planted at a young age, they didn’t fully take root until a couple years ago…and germination is a process the certified arborist knows a little something about. “I’ve always been fascinated with the laundry business,” he said, adding that what he found attractive is that it doesn’t come with the labor headaches most other ventures do. Customers appreciate the 300 Electrolux Washers and Dryers at Laundry City. In planning his top-of-the-industry store, Pinnock knew he had to have the laundry equipment to deliver five-star results, and that was a no-brainer. Growing up in Jamaica, he was quite familiar with the Electrolux brand and its reputation for quality. Pinnock, however, performed his due diligence and had many in-depth conversations with current store owners about their experiences with Laundrylux and Electrolux. Machine quality and efficiency was a huge part of the equation. The other half was if the brand delivered on its service promise. Pinnock was happy to find out, it did. “They have a culture of customer service that puts me at ease,” Pinnock said. But the Electrolux brand brings much more to the table. Wide aisles at Laundry City make laundry less of a chore. So what does Laundry City, the store billed as five-star facility, look like? Well for starters, it’s big…10,000 square feet big! Within that celestial body of space is a 250-square-foot kids play area and of course, 300 Electrolux Professional washers and dryers. The laundry’s lounge features classy elements never seen in this industry, such as a coffered ceiling and crown molding. And while plastic furniture may be fine for a one-star facility, “The World’s Cleanest Laundromat,” as it states on the building, boasts leather furniture inside its 400-square-foot adult lounge. 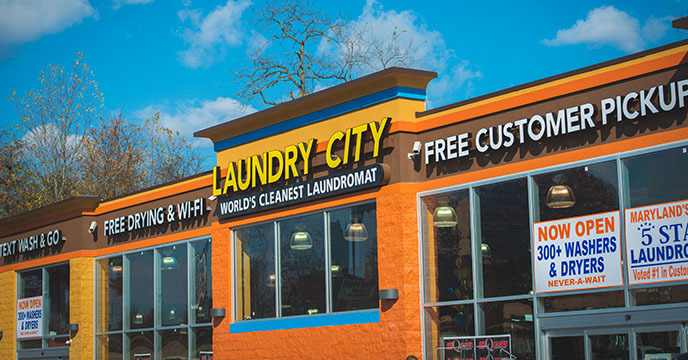 Pinnock felt it was important to “take it up a notch” and create a sizable quiet, warm, inviting area for customers to gather and utilize Laundry City’s free wi-fi. Add in large flat-screen televisions seemingly everywhere you look, and it’s clear Pinnock was fully invested in his effort to make this a premiere destination. “I wanted to take the chore out of the laundry task,” he said. Electrolux machines at Laundry City feature text messaging, Compass Pro for custom programming, and other unique innovations. Laundry City also puts advanced technology to use to further meet customers’ needs. Electrolux Professional washers and dryers have unique features engineered to reduce water consumption and gas usage, while delivering the best wash and dry results in the shortest amount of time possible. That customer experience is made even easier with Text Messaging technology. With this innovative Electrolux feature, customers can start their washer and are free to walk away to run errands or just relax. The washer will send them a text message when the cycle is nearing completion. If you’re still not convinced that Laundry City’s commitment to customer servic, is close to five stars, think again. This store clinches a five-star rating with chauffeur service. That’s right, Laundry City offers shuttle service from 9 a.m. to 10 p.m. each day. And if it’s not enough that drivers will pickup and dropoff customers, they’ll even help them cart their laundry in and out of the store. Rawlings-Blake and John Sabino, President of Laundrylux. It’s clear Pinnock takes great pride in not only providing his customers with exceptional laundry service – he also gives back to his community. The store partners with homeless advocates to provide free wash and dry services, while also underwriting neighborhood cleanup activities, and sponsoring youth sports teams. 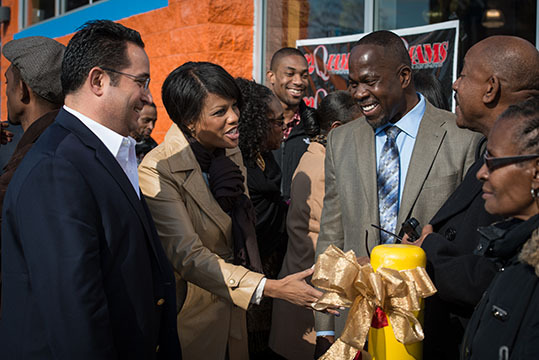 With his commitment to the city of Baltimore, it’s only fitting that dignitaries such as the Mayor, Congressmen, and members of the business community were on hand, along with representatives from Laundrylux and Electrolux, for a five-star grand opening and ribbon cutting. For Pinnock, it was gratifying that the community has backed his vision. “I was happy to see a strong turnout from the community,” he said, adding that it was a reflection of the city’s support from the start of his investment in the neighborhood. 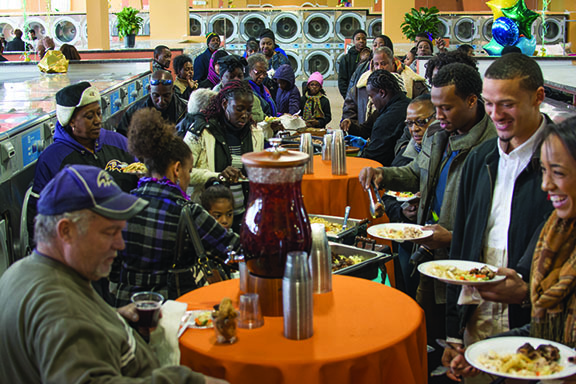 Customers at the Grand Opening Celebration at Laundry City. This entry was posted in News and tagged 5-star laundromat, Automatic Water Savings, AWS, Coin Laundry, coin laundry industry, commercial laundry equipment, Commercial washers and dryers, Eco Power, Electrolux, Electrolux Professional, Electrolux Professional Laundry, Electrolux washers and dryers, John Pinnock, laundromat, Laundry City, laundry equipment, laundry industry, laundry innovation, laundry solutions, Laundrylux, professional laundry, professional laundry equipment, Self-service laundry, vended laundry.